Enjoy uninterrupted wilderness views directly from your room at Moments Mountain Retreat. In-room double spas, open fires and some of the country's best bushwalks directly from your doorstep make for a romantic weekend in the picturesque mountain village Wentworth Falls. moments Mountain Retreat sits on an escarpment at the very edge of one of Australia’s most accessible wilderness areas in the World Heritage-listed Blue Mountains National Park. 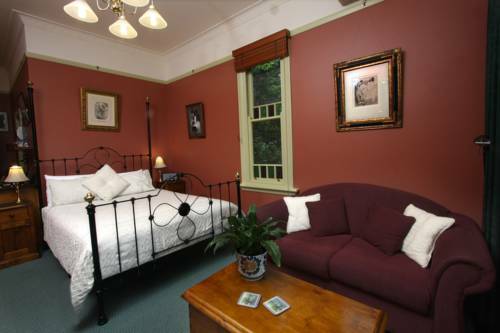 Situated at the entrance to the Valley of the Waters, moments Mountain Retreat offers magnificent panoramic views of Blue Mountains cliff faces, deep mysterious valleys and ancient Mountain Solitary, as well as direct access to some of the world’s best bushwalking tracks. Moments Retreat features 3 spa suites and 1 spa room with fires in most rooms and guest lounge. Experience relaxation and privacy at this idyllic guest house with full cooked breakfast with daily changing menu delivered to your room each morning to be enjoyed on the verandah. If you still need a coffee fix it's just a short stroll to Conservation Hut Cafe too. A 2 night stay may apply over weekends, 3 night minimum stay for long weekends and 4 night minimum stay over Easter. Travel west to Wentworth Falls via the Great Western Highway. As you enter Wentworth Falls village, a large pink hotel, The Grand View Hotel, is on your left. Proceed straight through the set of traffic lights at the hotel. Turn left off the Highway into Falls Road at the next set of traffic lights, (approximately 200 metres). Proceed straight along Falls Road approximately 1.2 kilometres, and turn right into Fletcher Street. (A brown tourist sign pointing to The Valley of the Waters at the intersection of Falls Road and Fletcher Street). Proceed straight along Fletcher Street for approximately 500 metres. Do not deviate right into a bend near what appears to be the end of Fletcher Street. Proceed straight ahead for a further 50 metres as Fletcher Street narrows. moments Mountain Retreat is No 86 on the left. Our large, open-plan Deluxe Spa Suites, Vera & Empress, create the perfect setting for your romantic getaway. The private verandah and wide window front offer you spectacular, uninterrupted views of the mountains which add unique ambience and beauty to these luxurious suites. A delicious, hot, gourmet breakfast is delivered to you each morning to enjoy in the privacy of your suite or verandah. After a hike to the waterfalls through our neighbouring National Park, enjoy a glass of champagne in the deep 2-person spa bath which is situated opposite an open gas coal-flame fireplace. The Wentworth Spa Room is unique as it has a private enclosed verandah to enjoy spectacular mountain and wilderness views. The large, bifold window opens across the entire length of the verandah which gives an openness and allows the crisp, mountain air to drift into the room. You can sit and enjoy your privacy and beauty of the Blue Mountains, even on a cool day! A delicious, hot, gourmet breakfast is delivered to you each morning to enjoy in the privacy of your room or verandah. 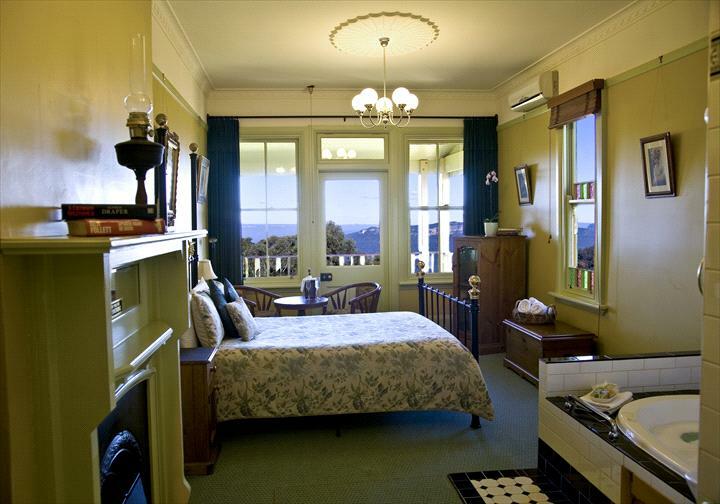 This cosy room also features a gas coal-flame fireplace opposite the bed to create a wonderfully romantic ambiance. Your private ensuite is fitted with antique stained glass windows surrounding a deep 2-person spa bath. Perfect to settle into with a glass of champagne after a hike to the waterfalls in our neighbouring National Park! The charming Den Fenella Spa Suite opens onto a private verandah with sweeping, uninterrupted views of the mountains and valleys below. This suite has a 2 seater sofa which also folds out to a king single bed. A delicious, hot, gourmet breakfast is delivered to your suite each morning to enjoy in the privacy of your room or verandah. The private ensuite has a deep, 2-person spa bath, perfect to soak in with a champagne after a day of bushwalking to the waterfalls in our neighbouring National Park!